Rule No. 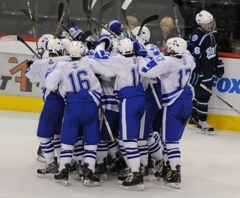 1 if you are a Minnetonka player with the puck on your stick in overtime. Shoot from the blue line and beyond, shoot from the side boards, shoot from behind the net if you must. From wherever, whenever, however -- shoot the puck. 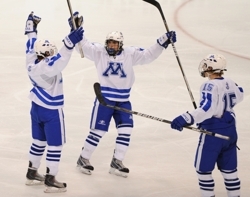 “You know, there’s never a bad shot,” Minnetonka coach Brian Urick said after his Skippers won their second overtime game in as many days on a long-range shot. “Especially when everyone is a bit more intense, thinking about the game situation. Hammering that message home was sophomore Vinni Lettieri, who followed defenseman Micahel Prochno’s heroics against St. Thomas Academy a night earlier by scoring 19 seconds into overtime to lift the Skippers past Blaine 4-3 in the semifinals of the Schwan Cup Gold Division on Thursday, Dec. 30, at the Xcel Energy Center in St. Paul. While Lettieri’s goal production has slowed since a start that saw him score six goals in the Skippers’ first four games, his hustle and intensity level has not diminishied, according to Urick. “He started out really hot,” Urick said about the son of former professional soccer goalkeeper Tino Lettieri. “He was popping a goal or two a game. And then, like a sophomore does, he is going to have his ups and downs during the year. So, apparently, do the Skippers. They have won three of four overtime games this season. As long as they do what Lettieri always does. 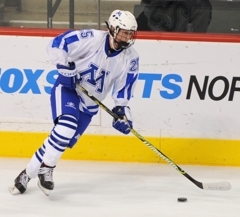 Sophomore Vinni Lettieri scored 19 seconds into overtime to lift Minnetonka to a 4-3 victory over Blaine in the semifinals of the Schwan Cup Gold Division on Thursday, Dec. 30, at the Xcel Energy Center in St. Paul. The overtime victory was the second straight for the Skippers (6-2-1), who opened the tournament Wednesday with a 5-4 overtime triumph over St. Thomas Academy. Lettieri, who is tied for the team scoring lead with 12 points, notched the goal after grabbing the puck along the sideboards, whiffing on his initial shot and then firing the puck through a maze of players. It was the second matchup between the teams this season and both went into ovetime. The teams skated to a 3-3 tie on Dec. 23. In Thursday’s rematch, Blaine (6-1-2) led 2-0 after the first period, Minnetonka led 3-2 after two and the Bengals got a goal from Dylan Lambert 4 minutes, 52 seconds into the third period to tie it at 3. Jesse Norling and Jonny Brodzinski also scored for Blaine. Michael Prochno, Derek Frawley and Max Coatta had the second-period goals for the Skippers, with Prochno and Frawley scoring on the power play. 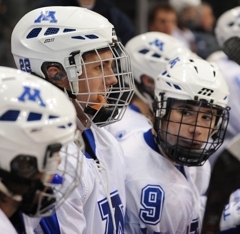 Nick Malvin made 32 saves for Blaine while Alex Glockner had 25 stops for the Skippers. The sophomore forward added another chapter to what has been an already eventful – and goal-filled – season when he scored just 19 seconds into overtime to lift the Skippers to their second dramatic, extra-period win in as many days. 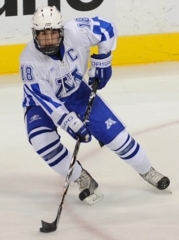 Lettieri, who was a star at the Bantam level last season, has seven goals this season. 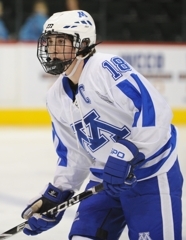 Another Skippers sophomore, Coatta scored to put Minnetonka ahead 3-2 in the third period when he launched a rocket that sailed into the upper corner of the net. Coatta showed his usual grit around the net, sticking his nose in the crease for potential rebounds and taking his usual pounding in the process. The senior forward scored a goal, added an assist and generally weraked havoc when he was on the ice. He sprung loose for two breakaways that he was unable to convert.